In February, Water Environment Federation (WEF; Alexandria, Va.) and Water Environment Research Foundation (WERF; Alexandria, Va.) leaders gathered in Chicago to sign a memorandum of understanding (MOU) renewing their partnership for the second stage of the Leaders Innovation Forum for Technology (LIFT) program. 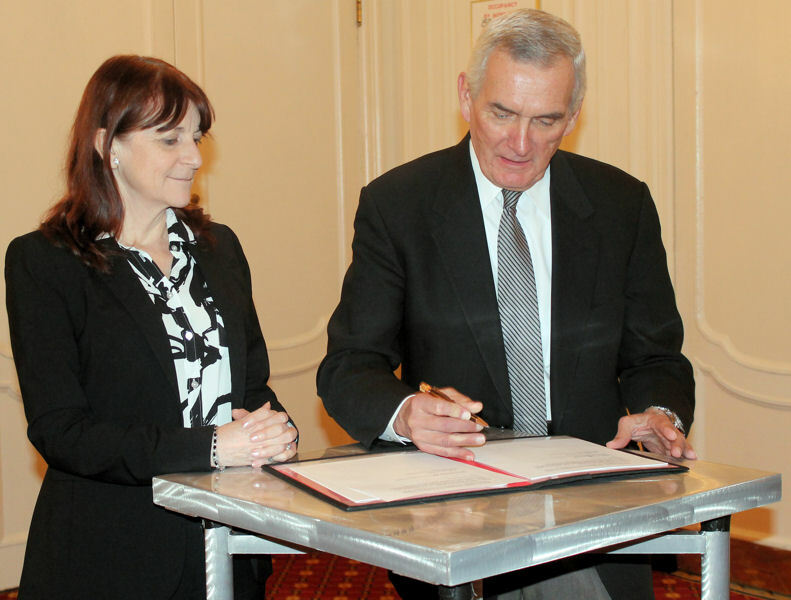 WEF Executive Director Eileen O’Neill and WERF Interim Executive Director Larry Jaworski signed an MOU to renew the WEF–WERF partnership for the second stage of the program — LIFT 2.0. WEF photo/Laura Leslie. LIFT 2.0 lays out a path for accelerating, informing, promoting, and funding innovation; creating an innovation environment; and promoting and connecting innovators. The MOU reaffirms both WEF’s and WERF’s commitment. LIFT is a joint program of WEF and WERF. The organizations work to accelerate water technology demand and adoption as well as to engage the water sector in all phases of the innovation process. LIFT facilitates the progression of innovative technologies from idea to implementation. WEF and WERF are working together to identify and track metrics to measure program success. Through LIFT, WEF and WERF will host the Intensification of Resource Recovery Forum (IR2) 2015. The forum will help the water sector redouble its efforts to move beyond merely complying with regulations to developing new opportunities to intensify treatment that will yield both strong regulatory performance and exceptional resource recovery. IR2 participants will help each other understand the possibilities available through technologies; develop partnerships among technology providers, consultants, and academics; form teams to move ahead with testing or implementing a new technology; and indicate the most critical research needs for new WERF research. The forum will be held Aug. 9–11 at Manhattan College (New York). For more information about the program, contact WEF staff member Marisa Tricas at mtricas@wef.org or WERF staff member Jeff Moeller at jmoeller@werf.org.